Animal rights is the greatest justice issue of our time. The fur trade is criminal, inflicting horrific torture upon their innocent victims. Fur farmers care only about profit, preserving the quality of the fur by using slaughter methods that keep the pelt intact, causing extreme suffering for the animals. They are strangled, gassed, suffocated, electrocuted, their necks broken and even skinned alive. There are no governing laws to protect animals, resulting in unbearable torment and agonizing death of defenseless animals who watch in terror as their cage mates are brutally murdered in front of their innocent eyes, knowing they will be next. Every year, more than 100 MILLION fur-bearing animals, including man’s best friend and feline companion, are murdered without mercy in the name of greed, vanity and ignorance. This count does not include rabbits, which the United Nations reports to be at least 1 BILLION killed each year strictly for their fur. The dog and cat fur trade is a largely unknown animal protection issue. Unbeknownst to most, the majority of fur-trimmed clothing and accessories (even trinkets and pet toys) labeled as “faux fur” is likely real fur, mostly from domestic cats and dogs. It is estimated that over 10 MILLION cats and dogs (most stolen pets and homeless strays) are brutally murdered each year for their fur, which is exported under false labeling to North America and Europe. China is the world’s largest exporter of animal skins. More than 95 percent of China’s finished fur garments are exported for sale overseas, and more than half are sold in the United States. Canada’s annual seal hunt is the world’s largest commercial slaughter of marine mammals – baby seals are clubbed and brutally slain for their fur, most skinned alive – so young, they have not learned to swim to save themselves from human predators. There are hundreds of fur farms in the United States: Wisconsin has the most farms, followed by Utah, Oregon, Minnesota, and Idaho. Animals on fur farms live in a constant state of fear and are kept in tiny, filthy cages deprived of everything natural to them, suffer from untreated wounds and cannibalized by their cage mates as a result. Trapping is still legal in the US and Canada. Each year, millions of fur-bearing animals are trapped and killed under the guise of “nuisance wildlife control” and millions more murdered in the name of fashion. Both targeted and non-targeted animals (including companion animals and endangered species) fall victim to these barbaric traps. Veterinary reports conclude that the fur trade inflicts “unacceptable suffering” with many animals skinned alive while still conscious and able to feel pain, their cries for mercy unheard. The way our animals are treated reflects the moral and spiritual compass of our humanity. To address the iniquitous and inhumane treatment of animals in our society is to address the complexity of the human condition and its collective consciousness, which perceives animals as commodities, rather than sentient beings who feel and suffer the same. Our society has become dehumanized and desensitized to the life of other beings on our planet, viewing themselves as superior to all other life forms. 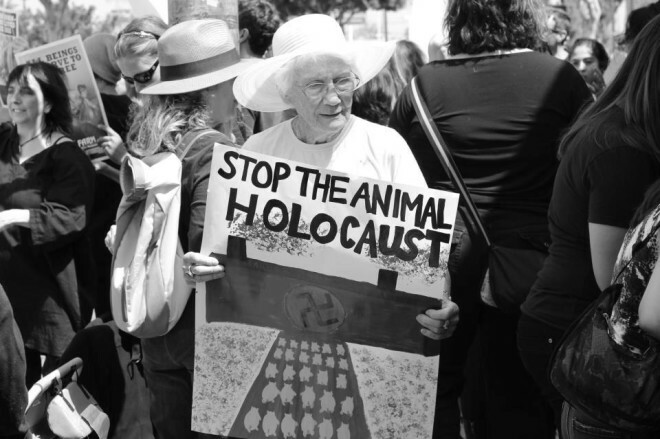 An egocentric society is perpetuating the holocaust of animals with no moral conscience or ethical boundaries. The more we feed into ego consciousness and its false sense of power, the larger it will become. Ego feeds itself, causing diabolical destruction in its wake, attempting to fill a void that cannot be filled without the revelation of truth and what is really sought after. We cannot cure the disease of inhumanity unless we heal the source. Any lesser remedy is akin to applying a bandage to a severed limb. Interpreted from the soul perspective, my documentary film series bridges the link with a spiritual point of view to help heal the “condition of disconnect” in our society. My films do not rely on images of bloodshed, but do reveal the reality, speaking the voice of truth for the innocents who cannot speak the human language. If we cannot witness inhumanity, we cannot empower humanity, and we fail as a “human” species. If we are not willing to hear their cries or experience their terror, then we are not willing to bear witness to the truth, which is the only path to transformation. The perpetrators and the people who support the atrocity disconnect from the cruelty and perpetuate the condition. It is clear that until the consciousness of society is awakened, the fight for the welfare of animals will continue with no end in sight. The evolution of moral, ethical and spiritual principles in the treatment of animals in our society is the only paradigm that will transform social consciousness. Their unconditional love is the cure to the spiritual crisis of our planet. Animals are sentient beings – they are not inanimate objects. Their connection to life is on a soul level. I believe the animals are our teachers, our connection with our own souls. The animal kingdom is the conduit to the light of our own evolution – that is the sacrifice they are making on planet earth. Sanctioned killing is a violation of their inalienable right to life. As we relish in our freedom and right to life, liberty and the pursuit of happiness, our animal beings do not enjoy the same freedom: enslaved, tortured and murdered for human greed and the insatiable ego. Unfortunately, our society has not recognized that animals have the same inherent right to life, possessed by the very nature of their existence… this self-evident truth is not mandated by government. The constitution is extrinsic, not intrinsic. It is time for the soul of humanity to awaken. If not now, when? The time has come that atrocities committed against nonhuman animals be deemed morally, spiritually and ethically indefensible. The power of respect will change our world. **Note to our readers: We rely on donations to do this work and need your support. Please consider a donation, no amount is too small. This documentary film series is a call to action for the billions of animals around the world who die in silence every year, their cries for mercy unheard. We hope you will continue to stand with us in our important work for the animals, who are relying on us to be their voice and set them free. How can people do that to little creatures? I have got 2 of my own. I can’t understand how people can do this to any sort of animal. They are so loving and cuddly, all they want to do is have a big hug. Please leave them alone like the rest of animals in this world. We need to stop this all over the world. Many animals get stolen, we don’t know where they go on to, we need to find out. I live in the UK and we have animals stolen, never had it this bad. I just find it weird how animals have passports now and now we’re having all sort of animals in the UK. I think this is my opinion they are being shipped abroad. We can have up to 20-30 go missing but they’re the only ones we hear about. If people were more aware of this horrible torture, I think it could be stopped. Most people don’t even realize this! Viewing the trailer for this movie shook me to my core. I am constantly stunned at the countless heinous acts of cruelty people commit against innocent animals. I hope this film creates a groundswell of awareness and mobilizes our society towards a sea change in terms of our treatment of animals. I don’t understand how people could ever do something like this to animals — especially the people who do this as their full time job day after day. Such people need to seek psychological help. Too many animals have suffered and died as a result of people and their barbaric actions and arrogance. Stop torturing animals, innocent creatures, and killing them for fur or leather. THANKS FOR THIS MOVIE. YOU ARE TRUE HEROES!!!!! Everyone needs to read this and see the film. I thought the USA had laws against mistreatment of animals, as does UK, why aren’t these laws coming in effect?! Stop this barbaric and agonising slaughter! La barbarie sous toutes ses formes est cautionnée par les gouvernements. boutons-les hors de nos pays ces élus inconséquents! I am so ashamed to be one of the most vicious and uncaring species on earth when it comes to animal rights. Please stop torturing animals and killing them for fur or leather. Are we acknowledging that our skins are so ugly that we need furs and leathers of innocent creatures in the name of fashion, decoration and trend? Please stop being inhumane and show some humanity. God hasn’t created the world just for humans… God who created you and me – created all the living beings. Earth doesn’t only belong to humans. A FANTASTIC movie that reveals the sub-humans in regards to the BARBARIC CRUELTY they inflict on DEFENSELESS sentient beings. We must stand and tell people what is going on. We are their voices and we must speak up for these defenseless animals and stop this bararic trade for good. I’ve seen so much evil to do with the fur trade and China seems to be the main culprit. Each time we as humans kill and destroy, we might as well sell our soul to the devil. Makes me want to cry to think of all the innocent animals that suffer for the sake of vanity and profit! I’m embarrassed to call myself a human. People make me sick with their greed! I thank God for people like you. As a society, we have become desensitized to the suffering of others no matter what species… how did we get here? It is really a learned behavior that clearly needs to change by education. Animals should be treated like humans. People are too wound up in their own little worlds to care… this apathy towards the suffering is what let’s the people doing it get away with it!! Makes me sad and sorry to be a human. This Declaration of Animals’ Rights must succeed! We are their voices, this must be stopped. We must stand together to do whatever we can to stop the carnage. I can’t wait till there is no more of this! There’s got to be a way to get through to these people. Making a movie is a great idea! What are we? Are we really human beings? Did god make us like this? Did we come to earth to kill other living beings, to skin them alive to wear their skin for fashion to show how rich we are? How would we feel if we were skinned alive for someone else to use our skin? I wonder the monsters who are running this business, how can they sleep at night after hearing the cry of the innocent ones? How can they look in the mirror after seeing the helpless eyes of the voiceless? How can they eat their bread knowing that the money with which they bought the bread is by killing the ones who have never harmed them? There is a saying “when the bird is alive they eat ants, but when birds die ants eat them”… I believe in KARMA. The ones who are doing this barbaric act will also suffer equally. And I pray and wish that day comes soon.